Want to know about the Farm? At first, Ric hard and Janice Hamby grew the pumpkins in different locations in the Carolinas and Georgia. Then in 1989, when Hurricane Hugo hit the east coast, our crop was destroyed. Because the owners were committed to our partners to provide pumpkins, they went far and wide to buy pumpkins to supply to our partners. One of the places they found especially beautiful pumpkins was on the Navajo Reservation in Farmington, NM. The following year, they entered into an agreement with the Navajo Agricultural Products Industry (NAPI) to grow pumpkins. 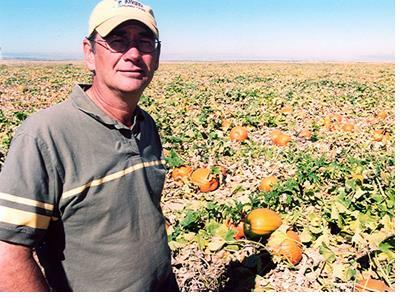 They lease the land and grow our pumpkins on the Navajo Reservation. The Pumpkin Patch pays for the land lease on the reservation, seeds, cultivation, fertilization, polarization, irrigation, labor, trucking, communication, etc. in order to provide this risk-free opportunity to our partners. For over 25 years Pumpkin Patch Fundraisers, Inc. has helped churches and non-profit organizations throughout America raise money by selling pumpkins—over $15 million during the past ten years and over $3 million last year. Last fall they shipped over 5.5 million pumpkins—enough pumpkins piled one on top of the other to reach the International Space Station orbiting 240 miles above the earth’s surface…and back. This company is a wonderful example of a “win-win” situation! The Navajo tribe profits from this arrangement, we raise funds….and the consumer has a top quality product. Thank you for being part of this full circle experience of helping!